When Abba Eban died in 2002 at the age of 87 he was praised for the passion and erudition of his public voice and its effect on international opinion. As Israel’s representative at the United Nations during the independence struggle of 1948, its ambassador to both Washington and the United Nations during the Middle East war of 1956, and its foreign minister during the Six-Day War in 1967 and the Yom Kippur War in 1973, he was the charismatic proponent of Israel’s right to exist. Compared to Winston Churchill for his eloquence, and often called “the Voice of Israel,” Eban’s burden was that he was always more popular outside of Israel than he was at home. For all his signature accomplishments, he was never elected as Israel’s prime minister. While arguably the most prominent of the Israeli doves, there was never an “Eban Plan” for peace. 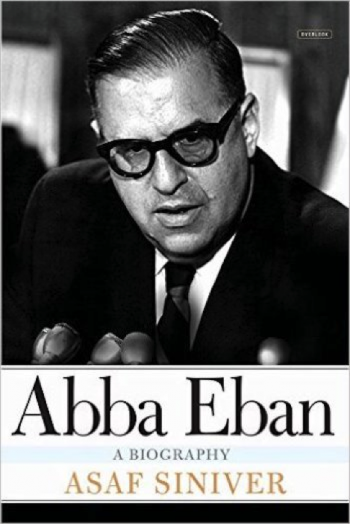 In Abba Eban: A Biography, Asaf Siniver has written the first biography of Eban in four decades. Drawing on extensive interviews and government material only recently made available, he explores the paradox of Eban’s career. Eban, so instrumental in shaping Israel’s early days and creating its special friendship with the United States, was ultimately unable to navigate the ways of Israeli politics as they increasingly operated under rules that he could neither understand nor abide. Eban emerges from these pages as a more complicated figure than can be found in earlier biographies, or in his own autobiographical writing. In a time when relationships with Israel and the Middle East continue to confound, we can learn from a deeper appreciation of the role Eban played in shaping – and trying to shape – Israeli politics over the years. Siniver’s levelheaded account looks at the history of Israel through the life of the country’s eloquent defender. In this engrossing, impressively researched biography, Siniver traces the career of a statesman acclaimed more outside of his country than within. Based on interviews with dozens of people and research in more than 20 archival collections, Siniver’s sympathetic, cleareyed biography deserves to be called definitive. In reading Siniver’s insightful biography, I contemplated what might have happened had the Israeli public and politicians listened to Abba Eban. Would Israel and her relationship with her neighbors been any different? One can only wonder. The first examination of Eban in nearly forty years, Abba Eban is a fascinating look at a life that still offers a valuable perspective on Israel even today . . . Informed and informative, This outstanding biography draws from a wide range of primary sources to create a complex portrait of a man who left an indelible mark on the quest for peace in the Middle East. Abba Eban is very highly recommended for personal reading lists, as well as community and academic library 20th Century Biography and Israeli History Studies reference collections. An engrossing, well-written book that deserves to be called a definitive biography, one that casts a great deal of light on Israeli diplomacy and the inner workings of the country’s domestic policies. A magisterial work of scholarship.